This month I'd planned to share my highlights from my #30daysofpaper over on Instagram, a daily photography challenge set by the lovely Jocelyn over at The Reading Residence. However I've been shockingly bad at taking part and keeping up with this so I've very few highlights to share. I've enjoyed seeing people's photos though, and I've included a selection of the shots below that I did manage to post. DAY 1: NEW, WELL NOTEBOOKS... OBVIOUSLY! I've read two books this month, which might not sound a lot it's more than I've read for a while. Both have had the same effect on me, which is that once I've got into it, all I want to do is carry on reading and read to the end so I can find out what happens. And then I'm at a loss, because the book has ended and I'm still caught up with all the characters! I was lucky enough for Kate Thompson to send me a copy of this book after a conversation on social media. And I'm glad she did. It's set in London's East End in 1942 and is the story of the seamstresses at Trout's clothing factory in Bethnal Green. As the story unfolds, some of their secrets are shared and each brings the central characters closer together. During this book I sung along (in my head you'll be pleased to know), smiled, laughed, hoped and cried at some of the events as they unfolded. It includes a real life war time tragedy too, and is exceptionally well written - the event covered isn't one I knew much about beforehand but it must have devastated an already battered and bombed community. I'll not spoil the ending for you but it was a book that kept me up late reading until I couldn't read any more, and it's one I'd definitely recommend! The second book I read was sent to me by Prima magazine and it's release date is 21 May. This one's set in Cornwall on the Roseland Peninsular, which strangely enough we visited when we were in Cornwall last September, although I'm not sure I knew its name back then. And it was shortly after publishing this post on Pretty St Mawes, that I started to read this book, which was really quite a coincidence. The central character travels to Marrakech and as well as making a new friend and making a life-changing decision, there's another coincidence too as that's where we went on our mini-moon immediately after our wedding back in 2007 so lots of that was familiar too. The Marrakech trip sets up a connection that's revealed later in the book, and that's all from me or otherwise I'll spoil it for you. So this month the paper in my life didn't turn out quite how I expected, but there was still plenty of it. 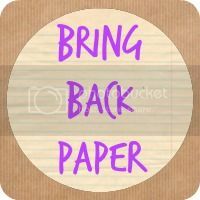 What paper have you had in your life this month?